Long time Mexico City area indy wrestler, of some note for his high flying in AULL. Brought in to AAA in 2008 as to fill in for Crazy Boy after Crazy suffered a back injury on a DTU show. 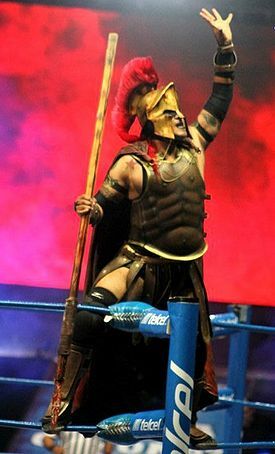 Crazy returned, but after Juventud Guerrera skipped TripleMania XVI in 2008 to work a NWE tour, and AAA gave Ultimo Gladiador his spot. As the Mexican Powers have broken up, and Crazy Boy's been used more as a single, Último Gladiador has dropped to an early match wrestler, but is still used fairly regularly for his position. After some months in the mid-low AAA cards he became the mistery Wagnermaniaco and has now been elevated to High-mid cards of AAA. In 2014, Gladidaor quietly joined Los Infierno Rockers under the name of Demon Rocker replacing Devil Rocker while also wrestling as the new La Parka Negra at 2013's Héroes Inmortales VII replacing Zorro. This page was last edited on 28 February 2018, at 06:48.